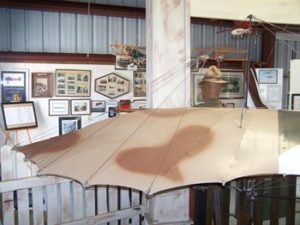 Etrich’s aircraft building began when he was able to obtain two gliders from the inventory of Otto Lilienthal in 1896. Etrich added a six cylinder in-line Austro-Daimler engine to his basic design that developed about 100 HP. Original manufacturing took place in Germany, but a legal dispute arose with others over the patent resulting in Etrich abandoning his patent leading to no less than fourteen other companies producing around 500 of the Stahltubes. These companies all made changes to the original design making it very difficult for historians to accurately describe the aircraft. Karl Illner, the co-engineer on the “Taube” project flew and set the first long-range flying record by flying from Vienna, Austria, to Horn, Austria, a distance of 45 miles. In addition, a two-man endurance record of a Taube lasting four hours and thirty-five minutes took place over Germany.The word “Taube” in German means “dove.” This was fitting as the profile of the aircraft represents a dove or bird. 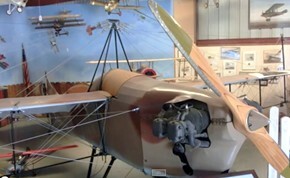 The aircraft was first used as a pilot trainer and an observation airplane. What is ironic is that the Taube “dove,” which is a symbol for peace, was used to bomb Paris in World War I. A lt. von Hiddessen dropped five small bombs on August 30, 1944. The stability of the aircraft in flight was considered to be its major asset. A person would think that the motivation for the design of the early airplane would be derived from the science of engineering. This was not the case. The facts are that the flight of birds and the travels of seed pods from plants impacted the early design of aircraft. The Wright Brothers were influenced by the flight of birds while Etrich was fascinated by the horizontal flight of seed pods to transport a seed from its parent plant to a new remote location. The seed pod of the Zanonia Macrocarpa plant helped generate the design of the Stahltaube. 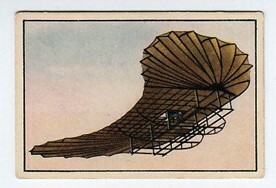 The general shape and configuration of this seed pod is clearly reflected in the early gliders that were designed and built by Etrich. These features were passed along in his engineering work on the Taube. Zanonia Seed Pod An Early Etrich Glider Flight controls on the very early gliders and powered aircraft were highly influenced by birds. Today when a pilot raises or lowers a wing tip in flight, referred to as “rolling” the aircraft, it is done primarily by the use of aileron control surfaces that are attached to the trailing edge (the rear part) of the main wing. The Taube does not use ailerons but instead utilizes a system known as “wing warping” for rolling the aircraft. 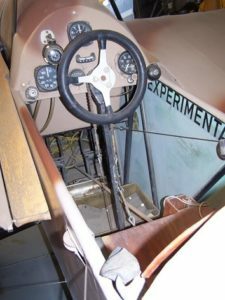 When the control wheel in the cockpit of the Taube is turned it transmits this motion through a system of cables out to the wing tips of the airplane. The wing structure at the wing tips is purposely designed to be flexible compared to the rest of the wing and the cable system is able to make the wing tips “curl” or “warp” somewhat like a bird does. This enables the pilot to raise and lower the aircraft wings as they do during the airplane making a turn to a new direction in flight.